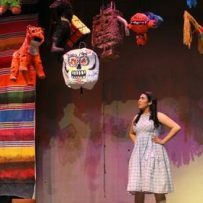 Plays - Silvia Gonzalez S.
Family Comedy 3-5F, 3-5M multiple set full-length loosely based on Alice in Wonderland, with a touch of The Wizard of Oz, we follow the whirlwind adventures of Alicia, a Hispanic Valley Girl teen. Alicia, a bratty teen visits a Mexican Imports Curio Shop with her culturally passionate mother. Warned to be careful in the back room by the store keeper, Alicia bumps her head after tripping over Mexican pottery. She then finds herself in a journey through media induced stereotypes and icons which are hilarious comments on today’s multi-cultural society. A contemporary, Latino version of ‘Snow White and the Seven Dwarfs.’Venezuela, South America. Blanca is ousted from her wealthy home by her evil step mother when her father becomes gravely ill. A servant is ordered to kill Blanca, but his heart gives way and he abandons her in the middle of a rain forest. Set in a Texas, Border patrol officer Roberto is just doing his job and deporting undocumented workers along with his partner Bill. Meanwhile, five Mexicans and an Salvadorian teen are riding in a sealed boxcar to ready employers. They feel they are going to get across safely until the engine develops mechanical problems. They are left in the desert and each hour the temperature rises. Manual pleads for all to remain calm and conserve their air until rescue. The others disagree and try everything they can to escape. When border officers reach them, it is too late for all but one man.